I’ve made no secret of the fact that Alan and I are on a mission to find Montana’s best luxury lodging properties. And now we can add a Grey Cliffs Ranch getaway to that list. In fact, Alan and I enjoy Grey Cliffs so much that we chalked up two visits in 2016—spring and fall. 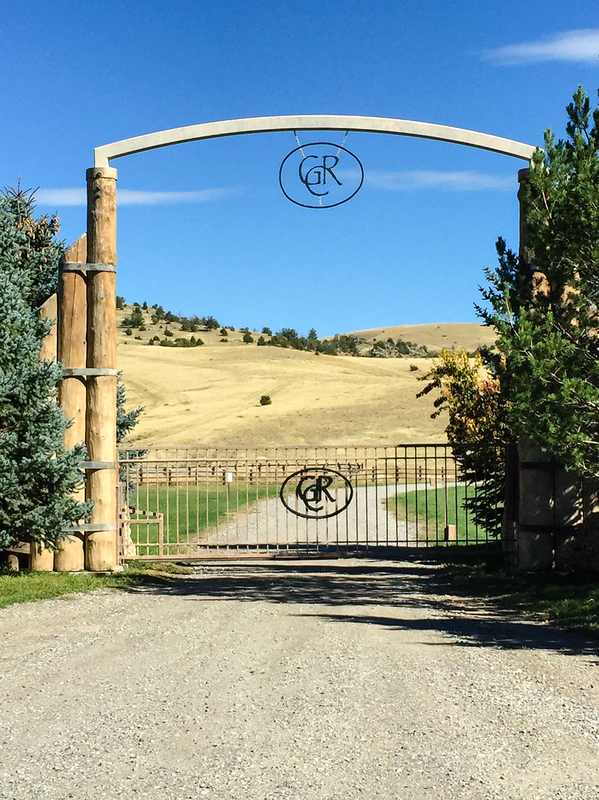 A Grey Cliffs Ranch getaway begins at the front gate. About 40 minutes southwest of Bozeman, in the Madison Valley, Grey Cliffs Ranch offers everything we look for in a romantic getaway or luxurious retreat. The 8,000 square foot post and beam-style Montana lodge includes 5 suites with all the amenities one would expect of a luxury property. And I appreciate that meals are included, although alcohol must be purchased from the ranch’s White Bison Saloon, located on the sun porch next to the dining room. 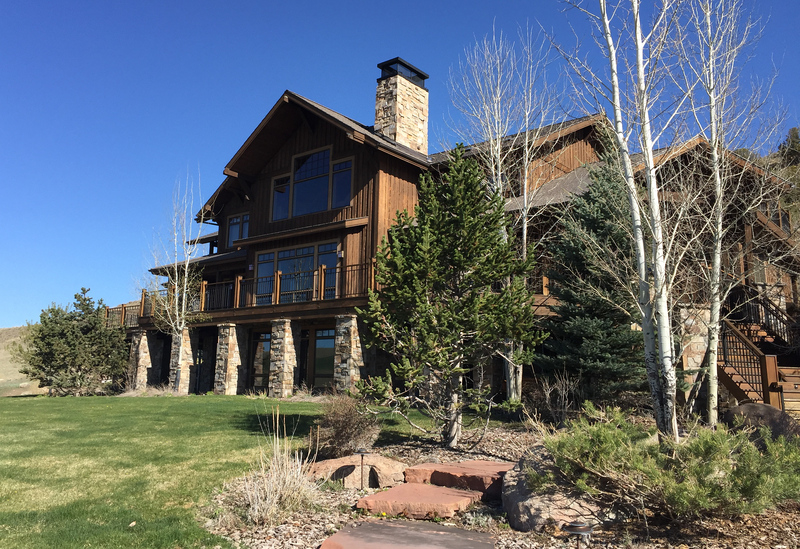 Stone and wood accent the lodge-style architecture at Grey Cliffs Ranch. The great room hosts a huge fireplace surrounded by comfy leather couches, the perfect spot for reading a book or snuggling together after dinner. Large windows offer panoramic views, with a spotting scope at the ready for a closer look at deer or elk. From the dining room, glass doors lead out onto an expansive deck, our preferred spot for greeting the day with a cup of coffee or enjoying a glass of wine before dinner. 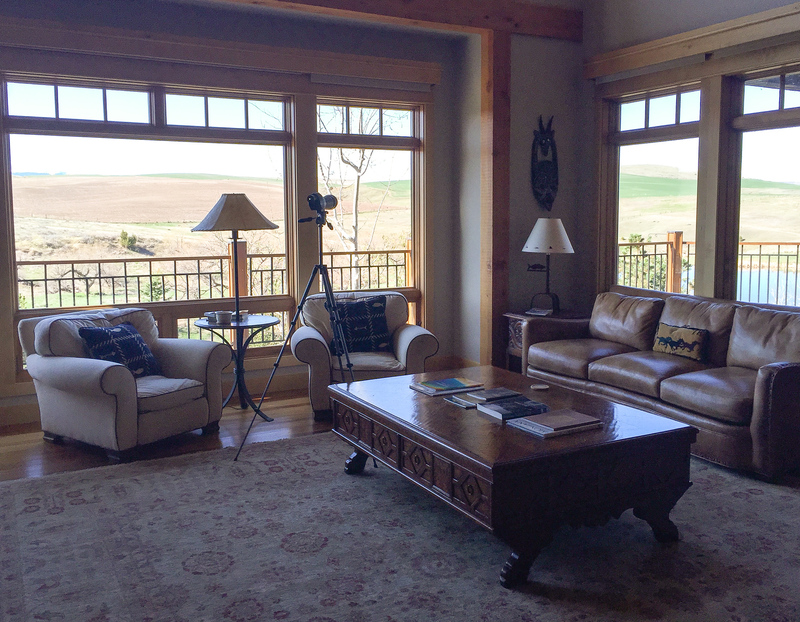 The great room offers comfy leather couches with a Montana view. In the downstairs family room, guests will find a kitchenette, work station, large screen TV and game table. Comfy chairs are placed next to the fireplace, another great spot for reading a book or writing in your journal. And Alan and I enjoy the outdoor hot tub on this level, especially after a day of hiking ranch trails. Meals, prepared by Chef Mike Welch, are included with your stay at Grey Cliffs Ranch. Chef Mike has wowed us with gourmet dinners using organic vegetables from the on-property garden. Those delicious omelets we enjoy in the mornings? The hens that laid those eggs live at the ranch. And talking with Chef Mike as he cooks and serves the meals is part of the fun. I could admire the view from Grey Cliffs Ranch all day long. You can go fishing in the pond, too. The ranch property is just as luxurious and romantic as the lodge. 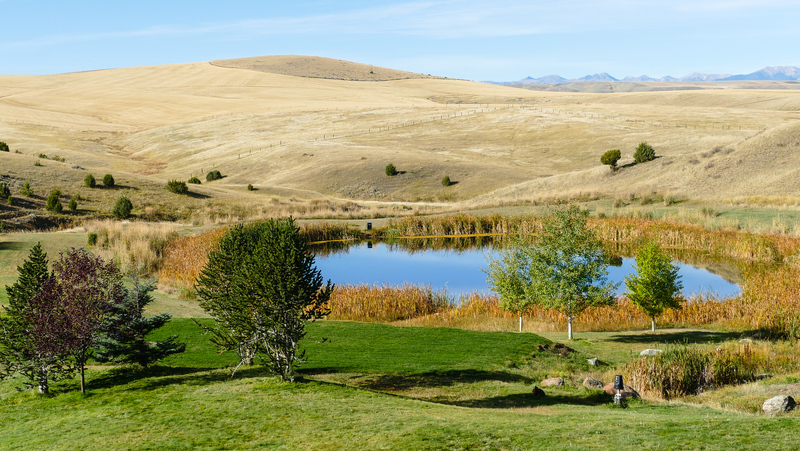 Sitting at 4,500 ft, rolling hills and rangelands spread out over 5,200 acres with majestic Montana mountain views. Once a cattle ranch, the landscape is being reclaimed for nature. By restoring wetlands and natural grasses to the environment, Grey Cliffs has become a wildlife haven for raptors, upland birds, deer and elk. Native Americans herded bison over the edge of the cliff at Madison Buffalo Jump State Park. On a late-April spontaneous road trip to Grey Cliffs Ranch, Alan and I traveled east on I-90 from Missoula before exiting the Interstate at Three Forks. 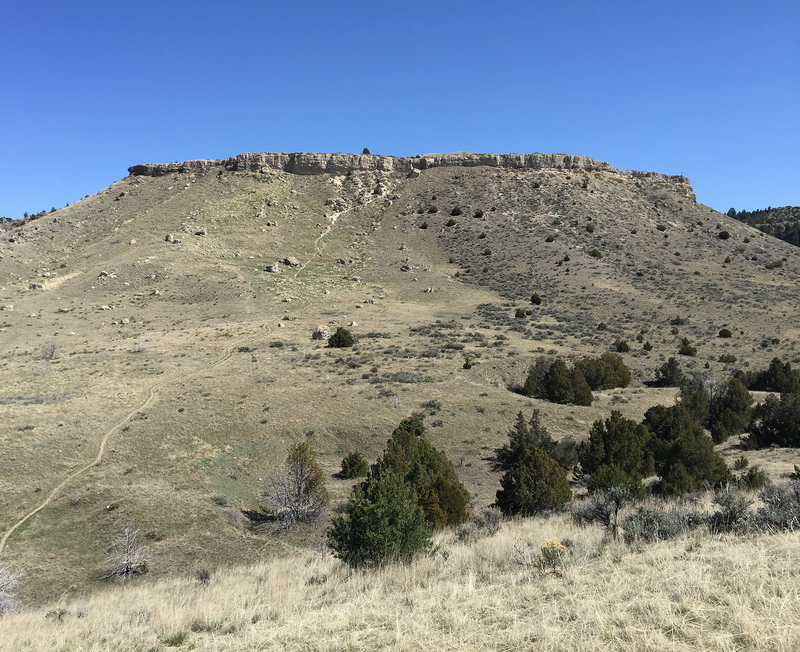 Exploring along the backroads, we stopped at Madison Buffalo Jump State Park to learn how, for centuries, Native Americans stampeded bison over the limestone cliffs. They used the dead bison for food, clothing, shelter and provisions—nothing went to waste. Exploring Madison Buffalo Jump State Parks also makes for a fun half-day trip from the ranch. Returning for a fall Grey Cliffs Ranch getaway, Alan and I arrived by way of a scenic drive through the Big Hole Valley and beyond to the ghost towns of Nevada City and Virginia City with a stop for lunch in Ennis. Exploring Nevada City and Virginia City is another doable excursion from the ranch. This view is worth the hike to the highest point on the ranch. Since both of our visits to Grey Cliffs Ranch have been for reconnecting, rest and relaxation, we chose to stay on property during our stays. Alan and I especially enjoyed hiking the trail to the highest point of the ranch, with views of the Madison Valley and beyond. 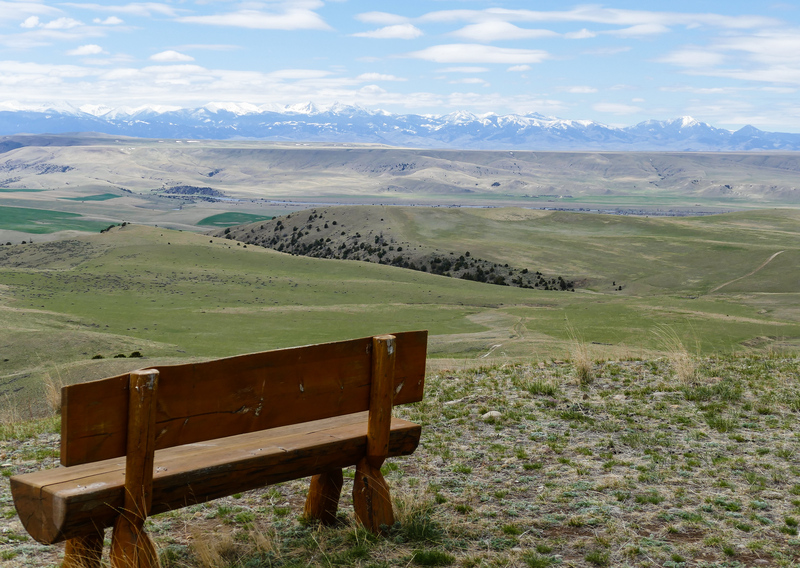 Tip: there’s a bench and a hammock at the top if you want to spend the afternoon gazing at Montana’s big sky. Next time, we’ll add fly-fishing from the ponds near the lodge and sporting clay shooting to our agenda. General Manager, Chris Pfadt, also offers guiding services, along with Ranch Lands Manager, Tracy Blashill. I’m thinking a half-day drift boat fly-fishing trip on the Madison River would be fun to try. Or Alan could fish and I’ll take a pottery lesson from Licia Lucas-Pfadt, Chris’s wife, who has a studio at the ranch. We’re lucky to live close enough to Grey Cliffs that we can spread the fun out. But if you’re an active boomer traveler on the trip of a lifetime to Montana, you’ll want to make the most of your ranch stay. So don’t miss driving the 1-1/2 hours to explore the west side of Yellowstone National Park for a day trip to visit the geysers. Or take the guided tour of Lewis & Clark Caverns available from spring to fall. And when I found out that Grey Cliffs has tubes for a lazy float down the Madison River, I quickly added a summer visit to my to do list. If the changeable Montana winter weather cooperates, Alan and I will soon be experiencing Valentine’s Day on a romantic Grey Cliffs Ranch getaway. We’re brining our snowshoes to hike the trails. More serious snow lovers sill appreciate the cross-country skiing, snowmobiling and downhill skiing available in the area. I recommend booking through the local guides listed on the Grey Cliffs website. Looking for off-the-beaten path ideas, hikes or four-wheel-drive trails? We always pack the Montana Benchmark Road & Recreation Atlas. One thing’s for sure. Even though Grey Cliffs Ranch offers complimentary wifi throughout the lodge, I’ll be turning off my devices on our next visit to spend time stargazing with Alan. Have I mentioned that Montana has a big sky? Do you have a favorite Montana luxury lodge? Come join the conversation at the My Itchy Travel Feet page on Facebook. Or send us an email with your thoughts. Disclosure: I’ve included an Amazon link to Montana Benchmark Road & Recreation Atlas for your convenience. However My Itchy Travel Feet receives a small percentage of the sale at no additional cost to you.